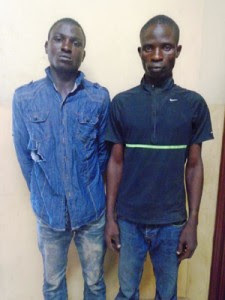 One of the two suspected pickpockets arrested by operatives of the Rapid Response Squad, RRS, of the Lagos State Police Command, weekend, in Maryland and Mile 12 areas Lagos, stole from a commuter while being chased by a mob ,he also said he spends his proceeds on prostitutes. “people who knew him in the area were monitoring us, unknown to us. The people after monitoring our operations for some time started chasing me. On sighting them, I took to my heels. They were many, they caught up with me and started beating me. ”Taoreed said he was able to escape as he ran to board a moving Bus Rapid Transport (BRT). On his part, Kayode Jolaade, said that he was lured into the crime, after losing his job at a private security guard firm , based in Lagos. The State Police Public Relations Officer (PPRO), Superintendent of Police, Dolapo Badmus, who confirmed the arrest of the suspects, said that the two suspects will be charged to court for prosecution.